Hillary Clinton lauded the work of US State Department legal adviser Harold Koh shortly after he helped secure the release of Omar Khadr from Guantanamo in 2012, according to emails released by the State Department Monday in response to a Freedom of Information Act (FOIA) lawsuit filed by VICE News. "Thank you for all you did to get this resolved," then–Secretary of State Clinton wrote in an email to Koh, dated September 29, 2012. "So glad we got this done," Koh responded the following day. "After spending the last 10 years on GTMO, at least this young man finally has another chance." "Hooray! Thanks for the call to FM [foreign minister] Baird!" Koh wrote to Clinton and advisers Jacob Sullivan and Cheryl Mills. 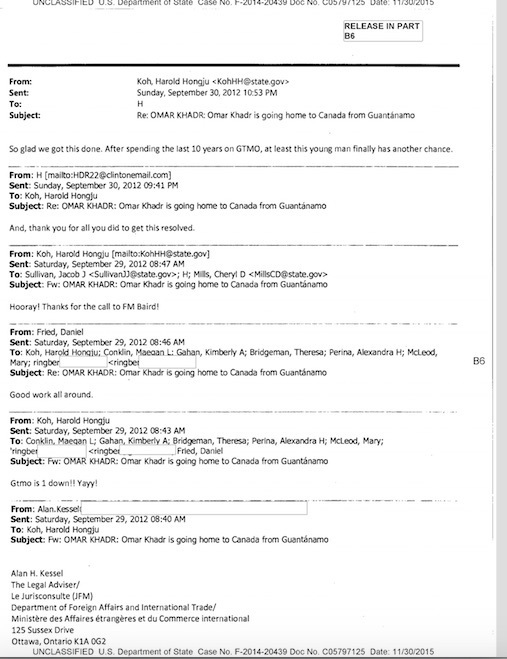 The emails, under the subject line, "Omar Khadr is going home to Canada from Guantanamo," celebrated Khadr's release. "Gtmo is 1 down!! Yayy [sic]!!" Koh wrote after he was sent a Miami Herald news report from Alan Kessel, then the legal adviser for the Department of Foreign Affairs and International Trade in Ontario, alerting him about Khadr's release. "Good work all around," responded Daniel Fried, then-State Department special envoy for Guantanamo closure. Khadr was one of the youngest detainees held captive at Guantanamo and also one of the detention facility's most high-profile prisoners. That Clinton personally weighed in on his case is somewhat unusual; other emails released by the State Department showed that Clinton and her advisors discussed Guantanamo in general terms, but that she did not discuss specific detainees. Her comments about Khadr's release underscores how significant and controversial his case was for President Barack Obama and his administration; Khadr was the first detainee to be prosecuted under Obama's revised Military Commissions Act, and he was the only person to have been tried by a military tribunal for war crimes committed as a child since World War II. The emails lend credibility to a 2010 report published by NBC News that claimed Clinton personally intervened on the eve of Khadr's scheduled military tribunal by phoning Canada's then–foreign minister Lawrence Cannon to explore ways to resolve the case. The tribunal never happened, and Khadr accepted a deal in which he pled guilty to war crimes charges in exchange for an 8-year sentence. Khadr was sent to Guantanamo in October 2002, when he was still a teenager, accused of tossing a grenade in Afghanistan that killed US Army combat medic Christopher Speer during a firefight in which Khadr was seriously wounded. Khadr and several others — including a former guard — have recounted physical and mental torture Khadr endured at the hands of US military personnel while in custody at Bagram Air Base in Afghanistan and at Guantanamo. Khadr is now free on bail in Edmonton, Canada. The 7,800 emails the State Department released Monday mostly cover 2012 and 2013 and, along with previous batches, reveal that Clinton was a staunch supporter of shutting down Guantanamo. In the latest tranche, Koh and other officials had presented the current Democratic presidential frontrunner with proposals aimed at shutting the prison. But what Clinton was told remains a mystery. One so-called "strategy paper" Koh sent her on August 9, 2010 was completely redacted except for the title, "Closing Guantanamo: The Big Picture," and citations to four attachments that were also withheld: "Regaining our Footing on GTMO"; "A Way Forward on Detention Issues"; "Closing Guantanamo: The Numbers." The four-page paper was sent to Clinton more than a year after Obama had signed an executive order promising to close the facility within a year of taking office. Last week, Obama signed a defense authorization bill that will hamper his effort to make good on his promise of shuttering Guantanamo before he leaves office. The legislation contains a provision that prohibits the administration from using any funds to transfer Guantanamo detainees to the US. In a signing statement attached to the bill, Obama said the restrictions placed upon him by Congress may be unconstitutional and interfere with his executive authority.